Sol House The Studio Calviá Beach sits in the heart of Magalluf,a few steps from the beach, shops, restaurants and nightlife of this vibrant city.The hotel has everything for a fun break in the sun including seasonal outdoor pool and poolside bar,sun deck, solarium and gym. There’s a packed entertainment programme including live music and DJ sessions and plenty of meal options at the restaurant. Sleek rooms come with a balcony, flat-screen TV, mini fridge, and free WiFi to keep you connected. The modern, 4-star Melia Calvia Beach is located right on the beach, a short walk from Katmandu Park, with impressive views of the coastline and mountainous regions. The hotel features a number of swimming pools and restaurants, a fully-equipped gym, and a sauna. The air-conditioned guestrooms are each fitted with a satellite TV, a private balcony, and a private bathroom. The Level at MELIA CALVIA BEACH: The Level Rooms and Suites boasts panoramic sea view and offer a wide selection of extras: access to the Level Lounge with Reception, Restaurant, Pool and Solarium, daily aperitifs and permanent offer of coffee/tea and refreshments, coffee maker and welcome gift in room and much more benefits. 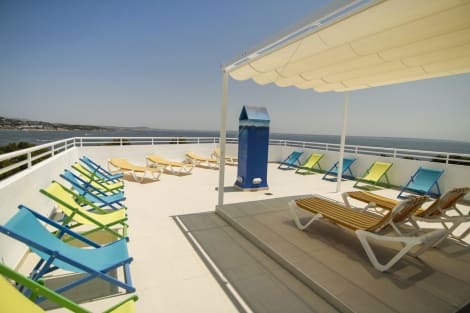 A 4-star contemporary hotel by Magaluf Beach, Sol Wave House is a high-tech and cool place to stay. With the free wifi, you can make the most of the hotel’s twitter-based concierge service, riding the waves on the surf simulators, taking a dip in the infinity pool, or treating yourself in one of the 7 bars and restaurants. And when you need to kick back, your room, with LCD TV, mini fridge, terrace and private bathroom, is a great place to unwind. Calviá Beach The Plaza - managed by Meliá, is just a 2-minute walk from Calvià Beach in Magaluf. The hotel has a fitness center with outdoor area and 4 swimming pools, including a suspended glass bottom pool with hammocks, Balinese beds and Rooftop Nine rooftop bar, and newly built rooms with a modern design are equipped with Flat screen TV and terrace. They also include a private bathroom. The hotel is located in the new commercial area "Momentum", next to the pedestrian boulevard of Avenida de Magaluf, with a selection of shops, entertainment, restaurants and bars with terraces where you can enjoy the latest culinary delights. The hotel's buffet restaurant, "Food Factory" the food factory, serves Italian Mediterranean cuisine. Breakfast and dinner service. NOTE - Rooftop 9: Calvia Beach The Plaza hotel's solarium, restaurant and swimming pool areas will be closed from January 7 to April 11, 2019. The HALF BOARD can be enjoyed in one of the 3 hotels of the Complex: The Plaza, Wave or The Studio ". This option is possible from May 1 to October 15. Roof Top Nine bar Schedule: Winter time: 10am to 6pm and Lunch: 12:30 pm to 3:30 pm. Sol Katmandu Park & Resort™ is the first “fun-inclusive” themed resort in Mallorca with both accommodations and entertainment all right in the middle of theme park fun, just steps from the beach. The 4- star resort is located in Calviá Beach in Mallorca, only 250 meters from the beautiful Magalluf Beach. Retreat to a comfortable room after a fun day of play at Katmandu Park and enjoy a full range of amenities, proximity to the beach, clubs and shops. Hotel facilities include a themed buffet restaurant, complimentary sunbeds, unique entertainment, free Wi-Fi and more! Located in the heart of Magalluf, at few minutes walking to the Magalluf beach and the fantastic night life area, the HM Martinique offers you the best quality accommodation and services. The property also provides great entertainment facilities including mini golf, tennis course, large outdoor swimming pool with part for children, indoor heated pool and billiard. Wifi connection is availabe in room and public areas such as the lobby, bar, restaurant and swimming pool. “ME BY MELIA is a collection of hotels where culture, lifestyle and The ME People fuse create the essence of the brand” Located in the privileged corner of Calviá, the Melia South Beach lies alongside the sunning sandy beach. Spacious rooms with the same groundbreaking style that inspires every corner of the hotel. Free WIFI, terrace with Mountain View. In ROOM bar experience. 32” flat screen TV. Laptop sized safe. Luxurious Bathrobe. Hairdryer. Mood Lighting. Exclusive restaurants and bars. Breakfast Buffet overlooking Calviá Beach. Barbarossa, a selection of healthy dishes. Pez Playa offers high quality menus, cocktails and live music. 2 adults swimming pools and 1 for children. Skin INC Spa and 24-hour full gym. Pirates adventure show and a few kilometers from the amusement park - KATMANDU PARK. Bali beds are available… choose your bed, champagne and server, and we`ll take care of the rest. The 4-star Sunlight Bahia Principe Coral Playa hotel looks out over the gorgeous sandy beach of Magalluf from Torrenova on the southern coast. Lounge by the fresh water pool overlooking the sea, or enjoy a drink on the terrace. For a touch of pampering visit the spa or hairdresser. The hotel provides evening entertainment, and there is also table tennis, a games room and free wi-fi to keep you busy. Make yourself at home in smart rooms with flatscreen TV and a balcony or terrace. Overlooking Palma Bay, the contemporary 4 star superior Barcelo Illetas Albatros is adults-only. The hotel’s facilities include two outdoor swimming pools, a sauna, and a state-of-the-art gym. Pop by the Mediterranean Buffet Restaurant, Blue Restaurant and Lounge, or Bar Illetas for dinner and drinks. The airy rooms are fitted with a 32” flat-screen TV, complimentary wi-fi, and a private bathroom. Please note that Sustainable Tourism Tax is not included in the rate and needs to be paid directly at the hotel. With a stay at Elba Sunset Mallorca Thalasso Spa in Calvia, you'll be a 4-minute drive from Katmandu Park and 5 minutes from Palma Nova Beach. This 4-star hotel is 3.7 mi (5.9 km) from Puerto Portals Marina and 6.8 mi (11 km) from Cala Mayor Beach. Large modern building surrounded by palm trees. Make yourself at home in one of the 14 air-conditioned rooms featuring kitchens with refrigerators and stovetops. Rooms have private balconies. Complimentary wireless Internet access keeps you connected, and flat-screen televisions are provided for your entertainment. Conveniences include microwaves and sofa beds, and housekeeping is provided on a limited basis. When you stay at Club B by BH Mallorca in Calvia, you'll be near the beach, within a 15-minute walk of Katmandu Park and Palma Nova Beach. This aparthotel is 3.2 mi (5.2 km) from Puerto Portals Marina and 6.4 mi (10.2 km) from Cala Mayor Beach. When you stay at Universal Hotel Florida - Only Adults in Calvia, you'll be by the sea, a 4-minute drive from Katmandu Park and 6 minutes from Palma Nova Beach. This hotel is 3.8 mi (6.1 km) from Puerto Portals Marina and 7 mi (11.2 km) from Cala Mayor Beach. Make yourself at home in one of the 72 air-conditioned rooms featuring kitchenettes with refrigerators and stovetops. Rooms have private balconies. 43-inch Smart televisions with digital programming provide entertainment, while complimentary wireless Internet access keeps you connected. Conveniences include phones, as well as separate sitting areas and microwaves. Featured amenities include a business center, dry cleaning/laundry services, and a 24-hour front desk. Planning an event in Calvia? This hotel has facilities measuring 431 square feet (40 square meters), including conference space. Self parking (subject to charges) is available onsite. All guest rooms at the hotel are either air conditioned or centrally heated according to the season, and come equipped with a fully fitted "en suite" bathroom with shower, along with a direct dial telephone, satellite television, safety deposit box available for rental and either a balcony or terrace, most of which have exterior views over the pool and garden area towards the sea. In addition to the above features, all guest rooms at the hotel are also provided with a maid service, undertaking a change of towels as required, and change of bed linen once a week. lastminute.com has a fantastic range of hotels in Magalluf, with everything from cheap hotels to luxurious five star accommodation available. We like to live up to our last minute name so remember you can book any one of our excellent Magalluf hotels up until midnight and stay the same night.